Banner stands are very useful for any kind of business looking for a cost-effective way of getting a message across to customers and potential customers. They can be used in all kinds of settings too, from a window display with important information to notifying passing delegates at a busy conference who you are and what you are about. If you have decided that these is a must-have piece of kit for you, then you need to choose the right banner stand. So what are you looking for? And what do you want to avoid? Clearly, no one has a bottomless promotional budget and so getting a good deal is essential. Most reputable printing companies will have some great dals on design, print and quality of the actual banner stand itself. Not all banner stands are created equal and so if you intend on using them on a frequent basis, it pays to pay a little extra and get a better quality stand for your money. Companies who are regulars on the conference circuit will tell you that there is nothing worse than a banner or roller stand that last two or three conferences in peak condition, only for an all-important knob to drop off, rendering it obsolete. We have separated this discussion on size as we think that this is important to have a discussion on what you want and need in terms of the physical size of the banner stand. There are some that are lightweight and narrow, where you can use have more than one printed and can be easier to handle, as well as more versatile in placement. Then there are bigger, wider banner stands that can form the backdrop to a booth or stand at a show or conference. Clearly both have the plus points with some companies investing in both to creating a stunning backdrop. That said, although they are not overall cumbersome of fiddly to deal with, some people prefer the smaller, narrower sizes so that they can handle them better. There is a huge amount of space on which to fit and emphasis your message. To the graphic designer, this is a great space on which to design and create something fantastic. To the small business doing it themselves, it can seem like a huge, blank and intimidating canvas that they MUST fill! As a result, there will hundreds of words in a font too small to read and images that make no sense at all. Use the design space well, and your banner stands can have maximum impact for your business. However, over stuff it with nonsense and it will not do anything. Any designer starts with a brief and so to avoid the cacophony of nonsensical words and images it pays to understand what your design needs to do. We also think that this applies to choosing which banner stand is right for you. Knowing what and how you are going to use it is important. A key question can be is the banner going to be displayed outside? If so, and this is going to be something it will do time and time again, opting for not only a better quality stand but a better quality banner too will make all the difference. You may want to create an impression but making sure you are creating the right one is important. A cheaper, flimsier banner stand can soon become to look tired and past its use-by date very quickly. But just as you may need to spend a little more to get a little better quality, going all out and buying the top end product to be used once is perhaps not the best use of your finite resource, known as money. The banner stand present a unique tool with which you can connect and engage an audience with but what tends to happen is that people only invest in one or two. We feel that they are an under-used resource and that they can in themselves, create a great display. If you are artistically minded, you can create a story across several banner stands and invite people to take the journey of reading in. Why not have people weaving in and out your banner stands, being part of your display or exhibition? Banner stands are fabulous. They are cost-effective at delivering your message but make sure you get the right one – and it can be used again, and again and again. Given that this is the season for trade shows, fashion shows and the final outdoor events before the cold grip of winter sets in, we are getting more calls for large format printing than ever. It makes total sense - companies want maximum visibility at these events and this is where large format shines. What better way to gain visibility than with a large poster or step-repeat banner? Thing is, in any printing projects size is just one consideration. If you are trying to really make an impact then we have a few simple tips to get your money's worth when it's time to go to press. All too often we see people trying to do far too much with the space they are given. Either they try to spell out too information, which no one will ever read. Or they toss as many shiny graphics as possible, resulting in a garish potporri of design violations. The real key here is to decide what your message is going to be. If brand visibility is your goal, then the logo should be the dominant element of the layout. If you are trying to grab people with an offer, make an attention grabbing headline the focal element, followed by your brand. With this much real estate, it's all about priorities. Clients often come to us, frustrated from working with another printer because their graphics printed a bit blurry. We look at their files, and the resolution is technically ok, but the final print is just not as crisp as they wanted. At this stage our only recourse is to recommend the use of vector, as opposed to raster art. For the uninitiated, rasters use square pixels, like a mosaic to create an image. This is where people turn to Photoshop or GIMP. Vectors, as authored by Illustrator or Corel Draw, utilize geometric equations to render shapes. While this may sound unimpressive at first, it actually makes a huge difference. Since the image is not made of tiny pixels, they will print flawlessly at any size. You could print a tiny graphic onto a bus, and it would still look razor sharp. While vectors are the obvious choice for logos, icons and text, there are some instances where they are not suitable, and photography is one of those cases. When you absolutely need to use an image, you must ensure that the resolution is high enough. So how much is enough? It depends on the quality and placement of the image, but a general rule of thumb is to have it be 200-300dpi at actual size. What we mean by that is the document size needs to be set to the proper dimensions. For instance in Photoshop, if you wanted to print a 24"x36" poster, you would set the document width to 24, height to 36 and the dpi to 200 (We recommend 300dpi for optimal image quality). Keep in mind you cannot just add resolution to a poor quality image - the source must be of high quality. While this may sound like impractical advice at first, you'd be surprised how many people are just not content with the size of their artwork, even after you tell them the dimensions. Our advice when dealing with logos (especially on a step repeat banner), is to print out a small section of it, preferably where the logo resides. This way you can decide if it has the legibility you are looking for. It's also an effective technique for deciding if your images have enough resolution at the specified size. So you’ve been bitten by the entrepreneurial bug and you’re thinking about starting up a custom T-shirt shop using heat press vinyl. Or maybe you’re already in the sign and graphics business and are interested in expanding to garment decoration. In either case, you’ve probably wondered how the imprinting process works and what you need to get started doing imprintables. Wonder no longer. We’re here to give you the scoop. For simplicity’s sake, this article will deal with CAD cuttable T-shirt graphics, otherwise known as “T-shirt vinyl” or “heat press vinyl”. There are digital print options too, including solvent printable films, dye sublimation, and ChromaBlast cotton decoration. But to keep it simple, this article will focus on heat transfer films you can use with your vector software and vinyl cutter. Fabric Imprinting Hardware: almost the same as for vinyl signmaking. Since both sign making and CAD T-shirt graphics are vector based processes, the essential hardware for making T-shirts is almost the same as that for making vinyl signs. You’ll need a personal computer, a cutting plotter or vinyl cutter, and some vector software. 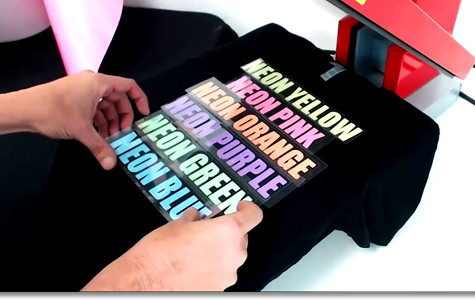 There is an important difference in the list of essential tools for making T-Shirt graphics. In addition to a vinyl cutting plotter, PC, and software, you’ll also need a heat press. If your production goals are modest, you can begin with a small inexpensive starter press. Fabric Imprinting Software: The same as vinyl sign making. Since you’re cutting out the “heat press vinyl” the same as vinyl for a sign, you use the same vector based software. You just reverse the image before cutting. Design and Cutting. Creating and applying letters on a T-shirt or jersey is almost the same process as making vinyl graphics. Almost. Before you send a design job from your vector software to a vinyl cutter, the file must be reversed so that’s it’s a mirror image of the original design. This is because of the way CAD heat transfer film is manufactured and shipped. Speaking of cutting, you may see references to something called a “flock blade”. 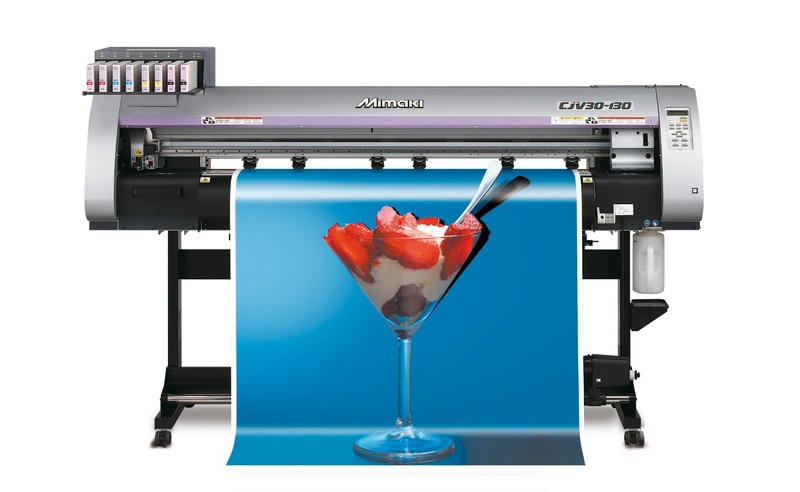 Most thermal transfer film is very thin so you don’t need a special blade or a lot of force. Siser Easy Weed and most of our standard PVC and PU films. The exceptions are flock films like Siser Stripflock, thicker metallic films like Siser Glitter, and of course reflective heat transfer films like Siser Reflect-All. For these you will need a 60° blade and perhaps a little more force. Once you’ve cut your graphic, weed it just as you would normal vinyl. Once it’s weeded, you’ll have the clear liner showing the graphic on the bottom. Place the weeded graphic on the garment on your heat press so that it is now “right reading”. If you’re still looking at a mirror version of the image, it’s upside down and will stick to the heat press instead of the shirt, which will probably ruin your day. Cover the film with a Teflon sheet or comparable layer to provide even heat distribution and prevent anything from sticking to the platen. Set the press for the recommended time, temperature, and pressure for the material and close it. Once you’re done pressing the film, wait the recommended amount of time and remove the liner. Sell and repeat. Each thermal transfer film has its own recommended time, temperature, and pressure settings. For further instruction visit our tutorial page!